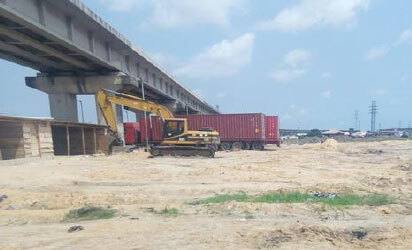 LAGOSâ€”THE contractor handling the 1000-capacity truck terminal in Orile are of Lagos State has withdrawn workers and major equipments from the site, leaving the construction work at a critical time, Vanguard has gathered. The project, seen as solution to the gridlock that had crippled commercial activities in Apapa and Tin Can ports, was expected to have been completed in October, 2018. Recall that Governor Akinwumi Ambode flagged off the project on August 5th, assuring motorists that work would be completed within eight weeks. The move is to end indiscriminate parking of trucks on highways. When Vanguard visited the site, it was gathered that the contractor, Planet Project, has re-deployed its staff and removed major equipments from site about a month ago. It was learned that construction works did not start on the project until about four weeks after the governor flagged off the project. Despite starting the project behind schedule, Vanguard gathered that the contractor spent several weeks excavating the top soil from the site. It was also gathered that the contractor failed to deploy the needed heavy equipment to site early. Confirming Vanguardâ€™s investigation, President, Association of Maritime Truck Owners, AMATO, Chief Remi Ogungbemi, lamented that a month after the State Government promised to deliver the park, meaningful progress werenâ€™t achieved yet. The Amato President said that the contractor left site when they had anticipated that their suffering would end with construction of the terminal. Ogungbemi said: â€œWe were happy that the state governor flagged off expansion of the terminal to accommodate more trucks. But as I speak with you, the contractor has removed their equipment from site. They have not completed one-quarter of the job and they have left site.